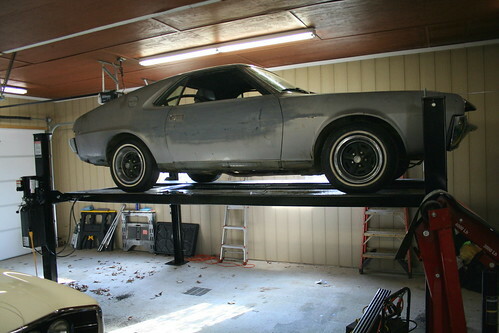 Our Dannmar Lift made this tear down project much simpler. 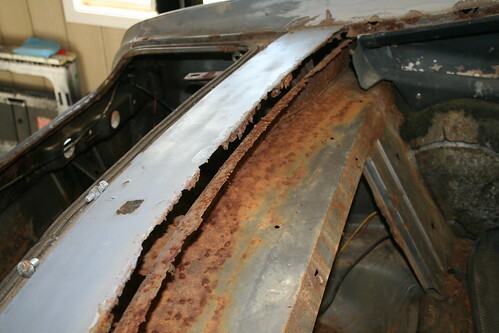 After we did our initial inspection it was clear there were a couple of rust areas that will require panel replacement so we started our search prior to disassembly. We weren’t sure what we could find and what we couldn’t and we didn’t want to tear the car down until we knew what we could replace. 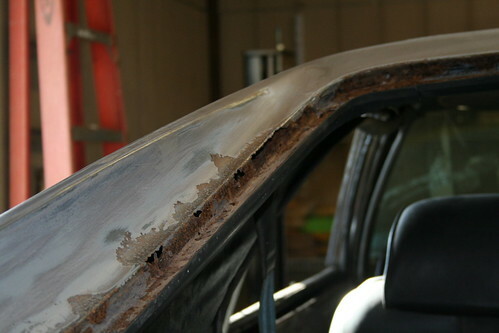 This old trunk lid is rusted beyond repair (for a reasonable cost) and has been replaced. Here are the new trunk lid and rear connector panel. We managed to find a nearly perfect used panel that goes between the rear window and the trunk lid. 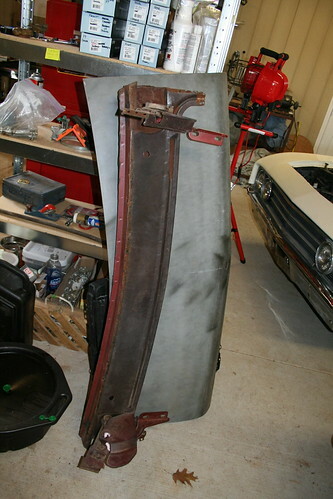 It included hinges and was removed at the original factory weld spots. 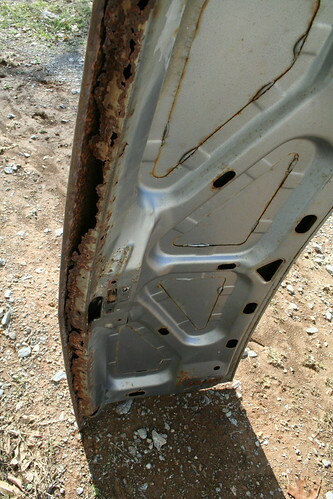 We also located a good used trunk lid and a good used rear splash panel all from rust free Arizona. This is the rear connector panel between the rear window and trunk lid that must be replaced. We will have to repair some of the rear window lip and some other smaller patches. The new rear window lip will need to be repaired. Every single screw, nut and bolt that comes off the car goes into a plastic bag even those that are too rusty to use again. It will help us to know what kind and size of screw/bolt to use when it comes time to put it all back together again. I have learned my lesson more than once that the old brain just doesn’t remember anything that I thought I could never forget. New rear lower quarters will be required for both sides. The inside of the quarters are strong, just the outside skin is bad. 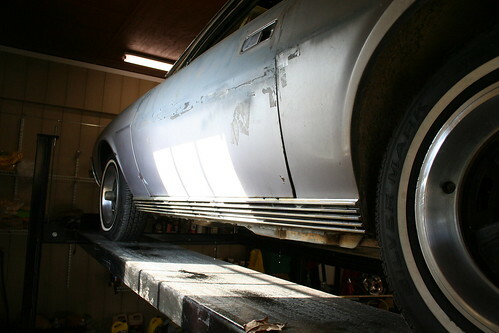 Although this AMX is basically very solid the rear panel has some rust and evidence of prior minor accident. We soak everything with W-D40 for a day or so and it seems to help but does not solve every stubborn problem. A new solid and straight rear tail light panel has been purchased. The rear splash pan is a little banged up; nothing major but we have purchased a good used one to replace this one. 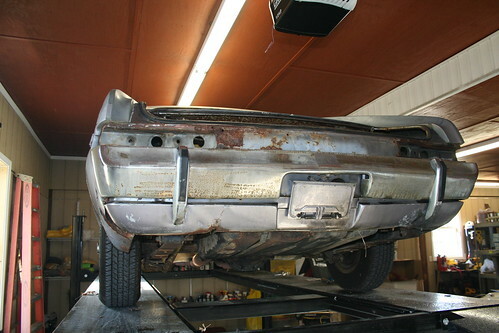 All the rear items have been removed. 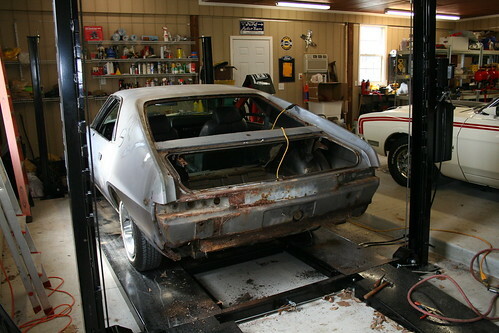 The next step is to do some blasting, fabrication, panel replacement and move to the rest of the body. 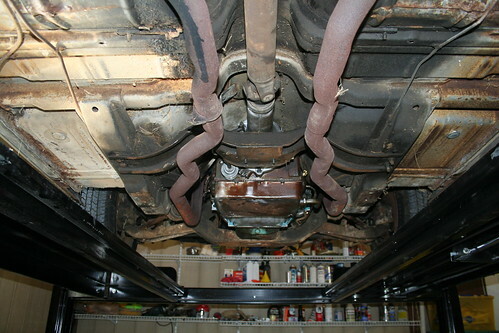 We put the car on our Dannmar lift and gave the underside a good once over. 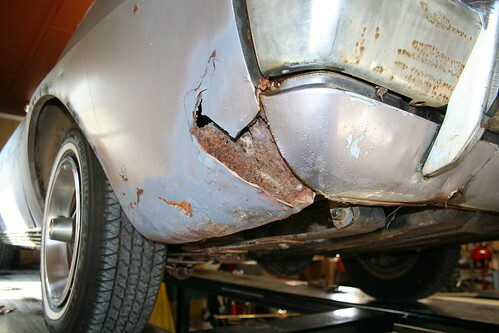 Good news, no rust through; bad news, a some surface rust. We will be doing some pressure washing and media blasting of these areas prior to undercoating. Since this car is being built on a budget to drive and not intended to be a concurs car it will not be stripped 100% or put on a rotisserie, just well done and refreshed to look new but not 100% assembly-line original. Great post! I need a lift like you have, just no place to put one yet!! !